Use mIRC to find FPS scrims or ringers! Tired of pubbing with people who have no idea what they are doing? Hate the fact that your getting team-killed or team flashed ? Whether you're looking into professional gaming or just simply want to compete competitively, this next tip will take your competition to a higher level. mIRC is a FREE Internet Relay Chat where millions of people come together to: chat, share files, form online communities and even, for you FPS fans, find ringers and scrimmages against fierce competition. [+] A Ringer is defined as a person who is substituting the place of an absence player for a group of people called a Team or Pug. [+] A Scrim on the other hand is a combined group of people(Team/Pug) versus another Team/Pug. *Note* Scrimmaging as it is called will undeniably increase your effectiveness in both your game play and your overall experience/knowledge of the game. Now for the big question, "How the hell do I get my hands on this program?" 2. After installation choose a nickname. 4. 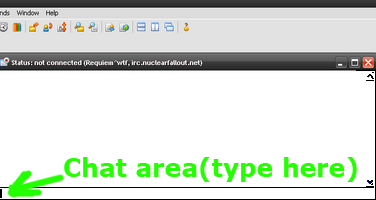 Click in the chat box area and type: "/server irc.gamesurge.net" This should connect you to a random Gamesurge server. 3. 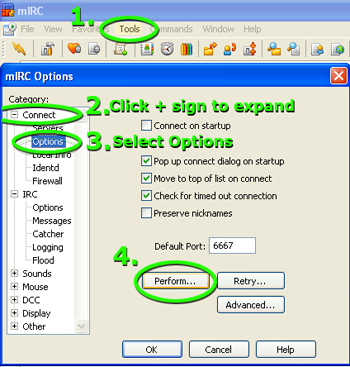 Once you activate your account via e-mail, now in the mIRC chatbox type "/as auth YourPassword". Congratulations, you're now authenticated. After clicking on Perform type in "/as auth YourAuthName YourPassword"
Now hit "Enter" and type in "//mode $me +x" This will hide your IP so that no one can see it but you! From the main window hit ALT+L or click on the "Channels List" button (4th icon from the left in the row with the lightning bolt symbol). Now you can join them from the "Channels List" or manually by typing in the chat-box window: "/j #ChannelNAMEhere"
Congrats! Through the use of mIRC to find scrims, you are well on your way to becoming a better player! PS: stop by our channel by typing "/j #fpsgod" in the chat-box when connected to the gamesurge network.